This gorgeous blueleather travel sized backgammon board is the perfect embodiment of high quality materials and superior craftsmanship you can expect in every Zaza & Sacci product. Finished in the highest quality Dollaro leather and with immaculate inlays on the playing surface, this backgammon board is destined to become a family heirloom for generations to come. In every Zaza & Sacci backgammon game, you can expect superior finish and construction. 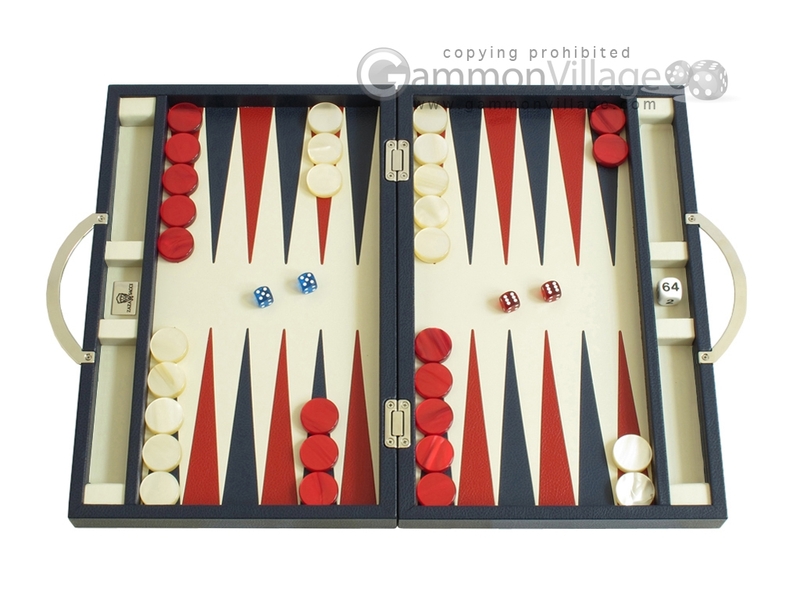 This compact travel sized backgammon set closes firmly with a nickel-plated magnetic clasp. Closed Length: 15 1/4" Width: 9 3/4" Height: 2 1/2"
Open Length: 15 1/4" Width: 19 5/8" Height: 1 1/4"
Page P4689 Copyright © 1999-2019 GammonVillage Inc., USA. All rights reserved.